Need to find out where your septic tank may be in your yard, and have no idea how to find it? 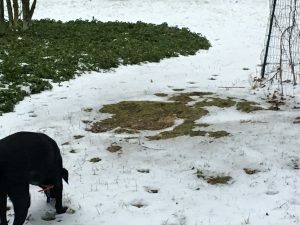 This time of year, when we have a few inches of snow on the ground, you may have a simple solution to locating your tank. In your basement, locate the area where the septic lines leave your home. 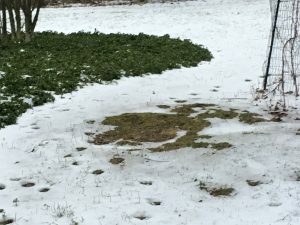 Outside the home, in the same side of the house where the lines are located, look for a melted area of snow, about 36″ or more wide. 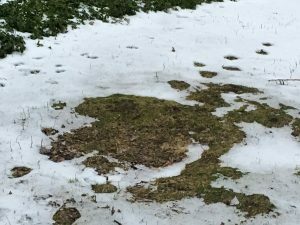 Snow may melt the fastest over the septic tank due to using warmer water than the frozen ground around it! Lids can be round concrete, about the size of a large pizza box, or square concrete, again like a pizza box. If you have a steel tank, those lids can be three to five feet across and many times have a “chimney pipe” installed to the surface or just under the surface with a lid for easier access. As always, you can call the Septic professionals at Wilson Services to do the locating and excavating for you! 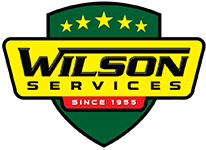 973-383-2112 or email us at info@wilsonservices.com! Our septic tank is a 1000 gallon concrete round tank buried 12″ deep and the lid is located under the large melted grass section in the pictures above! We have a few other ways to locate your tank if this easy method isn’t working for your system. Some tanks have already been maintained by our professional staff, and we file a location card on each tank we’ve pumped since, well, forever! We measure the location in regards to the home, so we can triangulate the lid for the next time you call us for maintenance! Many newer system have files on the system at the Sussex County Dept of Health. They have an online file of Engineering Plans, Repairs that have been made with permits, and possibly the “As Built” with the locations of all the system’s components. Failing all else, we have flushable trasmitters which let us “follow the beep” to the location of the transmitter, which hopefully lands right into your septic tank! Call the local septic professionals today and let us help you maintain your system’s health and life span!